Randy Henry has been Oregon’s Boating Law Administrator and manager of the Oregon State Marine Board Boating Safety Program since 2013. He has worked for the Marine Board since 1999, working as a public information officer until 2004, then serving as policy analyst until 2013. 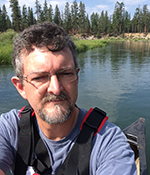 He has worked as a newspaper reporter and editor and spent nine years as a communications coordinator for the Oregon Dept. of Fish and Wildlife. He is a lifelong boater, hunter and angler, always wears a life jacket, allows no alcohol on his boat, and loves a good IPA. He is past president of the Western States Boating Administrators Association and is currently serving on the National Association of State Boating Law Administrator’s Strategic Planning Committee. As BLA for Oregon, his focus is safe boating, building productive and accountable partnerships with county sheriff marine patrols, fostering an awesome team of boating safety professionals, and retiring in a few years so he can actually use his boat and not just maintain it.